Second to weddings and portraits, architecture photography is one of my favorites. 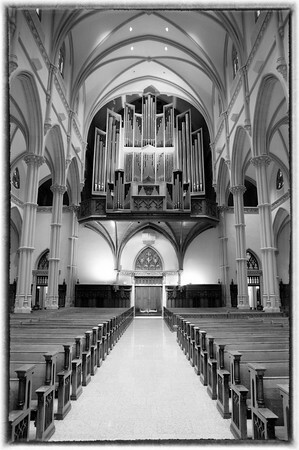 Recently, I photographed a wedding and the ceremony was at St. Paul's Cathedral in Pittsburgh (Oakland) Pa. Located on Fifth avenue this beautiful facility is a photographers dream. I could spend days, weeks, maybe a life time photographing all of the detail, lines, and beauty that St Paul's cathedral displays. The first picture is the back of the cathedral and what the bride and groom sees when they are leaving before greeting their guests. The back of the cathedral is where the beautiful pipe organ is located and is filled with an amazing combination of lines and shapes. The lighting creates beautiful shadows on the architecture and is breath taking when viewed in person. I always wonder how the designers and developers came up with these beautiful designs and if they fully realized the masterpiece they created. Personally, I find that the older buildings display a very unique air of beauty. The second image is what greets visitors when they walk in the back of the church. The beautiful pillars, arches, and lines are candy to the eyes (eye candy). The light bathes the area with beautiful shadows and highlights that emphasize the architecture and design. The third image is what the visitor sees at the back entrance of the cathedral. 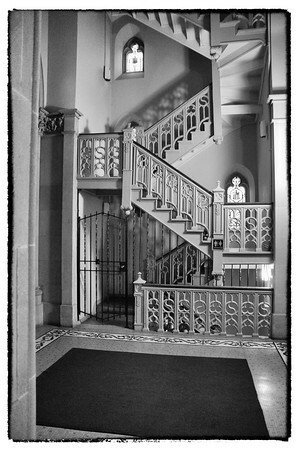 It is an amazing looking staircase and I used this to take fun and artistic images of the bride and her bridal party. 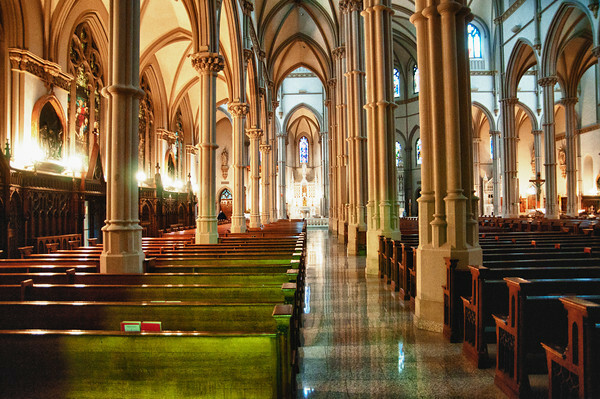 Watch for more images in the next week from this beautiful cathedral in Pittsburgh PA.
Beautiful photographs of a great cathedral! I am so glad that people around the world are, at last, appreciating the unique beauty and grandeur of Egan and Prindeville's finest work: Saint Paul's. Yes, it is beautiful! Thank you for the comments!